3000 km - 2initineres Webseite! Yeah we made it, it feels real good to have reached 3000km with man power. In one day we are going to be at the Black Sea in Constanta. Recently we got some complaints about the statistic of our daily achievments that was not up to date. In the German version of the Blog we get comments from our folowers from time to time. In the English version I am not sure if somebody is reading it at all … would be nice to have a short feeback. As you can imagine biker’s life is not that easy. Of course we normally have a nice day, we stop here and there, take a break, enjoy the landscape and arrive only in the late afternoon. First we have to find the hotel, then check in, unload the 11 bags with the weight of about 40kg from the bikes and and carry it up in the 2nd or 3rd floor in most cases without elevator. After a Shower and doing the washing of the clothing we normally update the statistics upload the pictures and route details and write the blog. Then we have to find a good Restaurant for Dinner, we also want to read the Newspaper and every once in a while watch one of the series of Netflix… and the day is over. Last Saturday morning when we started in Ruse, it was 3 degrees cold. We had a look around in town; I wanted to buy some other gloves, but all shops were still closed at 10’clock. The touring season of bikers like us seems to have startes, we met another biker with the destination China. We are not doing statistics, but the two Germans and the English Biker we met till now had long beards; I definitely will not let it grow; the itching after one week is too much that I would do the same. And Marie-Claire wouldn’t like it anyway! Always when our speedometer shows more than 22Km/h we either go downhill or we have the wind from the back, today it was flat and fast. It was good as Marie-Claire did not feel that well as she has a cold. When we arrived in the little village Tutrakan at the Donau she went directly to bed. I spent some time cleaning and greasing the chains of the bikes. Sunday breakfast was special, fried dough with some goat cheese and marmalade, not our taste. The scenary changed during the day, the flats varied with hills and the street was going up and down. 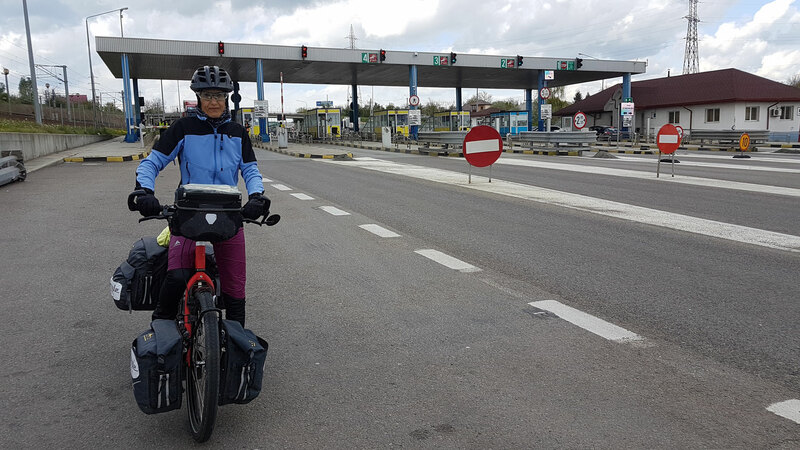 Fortunately we had only 60km to our next stay in Silistra. The early arrival gave us time for apero. A storm even supported us in our decision not to have to leave the hotel. Once more we had a nice dinner in a huge dining hall all alone with a waiter only for us. Silistra is the Bordertown to Romania. Today the formalities at the border took longer than usual, there were only some cars in front of us but we had to wait more than 30’. The customs officers have been working very carefully looking in each trunk and truck. 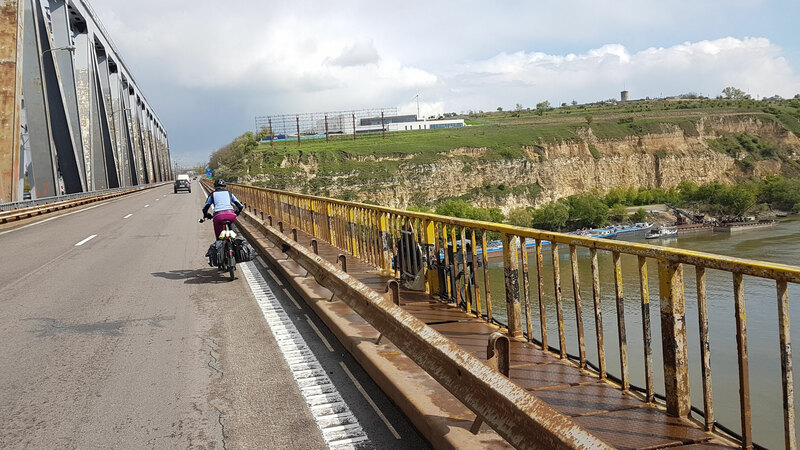 We finally arrived on the Romanian side at 1130. The ride was not really nice, we passed many small villages, the males hanging around drinking beer, trucks and cars doing racing and passing us in high speed. From Festesi to Cernavoda we got a new experience; we had to use the highway as there was no other road. With an uncertain feeling we approached the pay station, we expected that we might not be allowed to pass. The officers just waved us through, not even payment was requested. At the beginning all was fine, running on the emergency lane gave us a lot of space. But crossing the bridges suddenly there were only two lanes left, Marie-Claire was really scared. I went to the back and kept some distance to her. 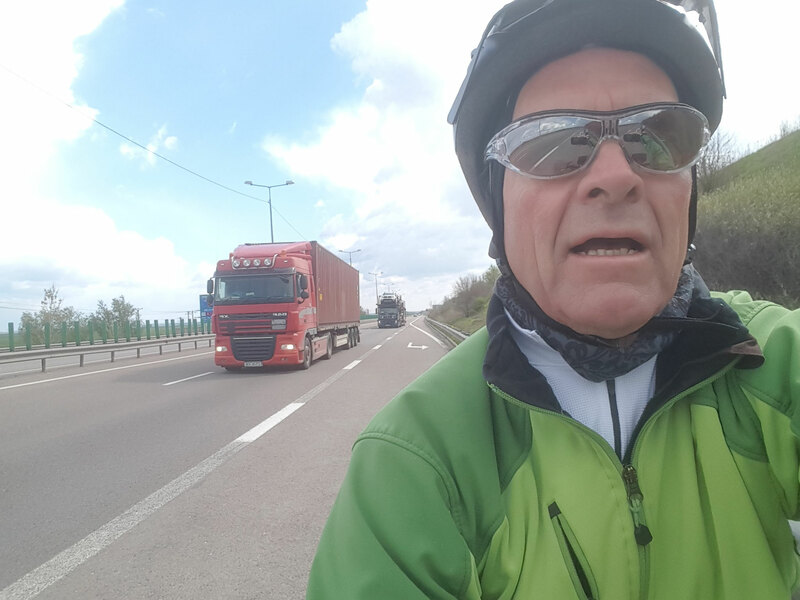 The Truck drivers have been very friendly; passing us with a big distance…After 20km the night mare was over, the exit lane to Cernavoda was in sight. We found a nice Hotel a bit outside of town, close to the Nuclear Powerplant. It was the first time we used our bike to go for Dinner. The day after we left early and headwind and heavy traffic was the topic but at the end we arrived in Constanta were we spend 2 days.